Fill out our simple form and get quotes from local dance floor providers. If you are hiring a marquee for your event and would like somewhere for your guests to throw some shapes, you will probably be considering hiring a dance floor. There are so many types of dance floors to choose from in terms of size, material, colouring, suitability for your venue and so on, that you may not know where to start. Submit a dance floor hire quote request today; it’s quick and easy to do and you’ll obtain all the information you need on the dance floors that are available. We can provide starlight white and black LED dance floors in a variety of sizes. Black and white LED dancefloors available up to 20ft*20ft. We can supply LED starlit dancefloors across Scotland, our dancefloors are also available at discounted prices with our wedding packages. 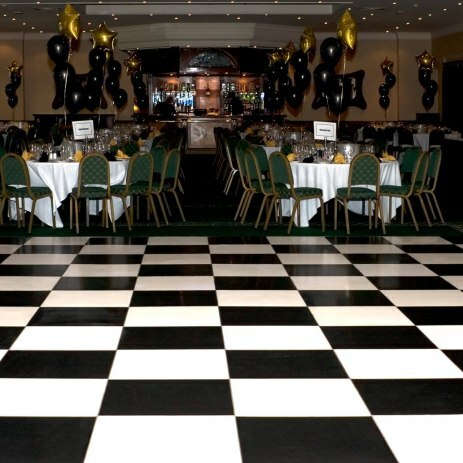 Selection of dance floors available for hire, Black & White, All Black or All White. We set up and dismantle the dance floor leaving you stress free. Are you considering hiring a dance floor for your event? Is there nothing you’d like to see more than your guests shaking their tail feathers? Shimmying the night away? Choosing the right dance floor hire option is really important. It needs to be spacious enough for people to be comfortable, it can’t be too slippery as those with heels won’t be able to relax properly for fear of toppling over. There is a lot to think about. If you’re interested to know more about dance floors prices, submit a quote request today.